On the Ionian Islands off the west coast of Greece, Hellas shows her greenest side: Pure nature, the crystal clear blue shimmering Ionian Sea and centuries of Venetian influences dominate the archipelago of the Ionian Islands. From Corfu, which was the dream island of the unforgettable Austrian empress Sissi, this journey leads you to regions which are not very well known abroad. Discover the famous island of Ithaca which is said to have been the home of Odysseus, the unforgettable green bird sanctuary island of Lefkas, the fantastic mountain world of Cephalonia and the beautiful olive woods of the small island of Paxos. Enjoy the stay on board of the wooden motor yacht and let yourself be pampered by the excellent Greek cuisine and the coziness of the ship! Individual arrival by plane on the island of Corfu and subsequent transfer to the ship. Check in on the Panagiota from 2 pm on. Dinner on board. Overnight stay in Corfu town. Cast off! In the morning we cross over to Sivota on the mainland of Greece. There our first cycle tour starts and leads us to Parga beautifully situated below a Venetian fortress which towers over the old town. Here the boat awaits us to take us on a long cruise to Nidri on Lefkas Island. On our way we pass a witty swing-bridge which connects Lefkas with the Greek mainland. You spent the night in the lively harbor of Nidri. After breakfast we start with a short tour to a waterfall nearby Nidri. With a bit of luck enough water will tumble for us to have a refreshing swim. Afterwards we continue on quiet roads over the hills via Siyros to the picturesque harbor town of Sivota. Here we board the boat and cruise to Fiskardo on the Island of Kedalonia. Situated on the northern tip of the island, the harbor town enchants with its colorful houses and many cafes and bars along the lively waterfront promenade. We leave Fiskardo by bike and climb an impressive mountain road on the west coast of Kefalonia, from which we are met by awe inspiring views over the Assos peninsula and the famous Myrtos beach. After the climb we turn inland and cross the island. Shortly before the end of the bike tour we visit the Melissani stalactite cave on board a small row boat and marvel at the incredible blue tones created by the unique cave formations, sun and water. In Sami the boat welcomes us and once on board, sets off for Vathy on Ithaka. In the morning we cycle on the Ithaca Island. The homeland of the mythical king Odysseus, is a hilly island with a beautiful landscape. On today’s cycle route we can enjoy the typical character of the Ionian Islands away from the beaten tourist track: gnarled olive trees, crystal clear water and friendly islanders – time appears to stand still on Ithaca. From Frikes the Panagiota takes us to the small island of Meganisi. On the way we pass the private island of the influential ship-owner Aristoteles Onassis. Meganisi is a tiny island with lots of charm, which we explore in the afternoon in no time by bicycle. Early in the morning crossover to Mytikas on the Greek mainland. From Mytikas we cycle along the coast and further on panoramic roads, passing some mountain villages like Paleiros until we reach Lefkas town, where our ship awaits us. 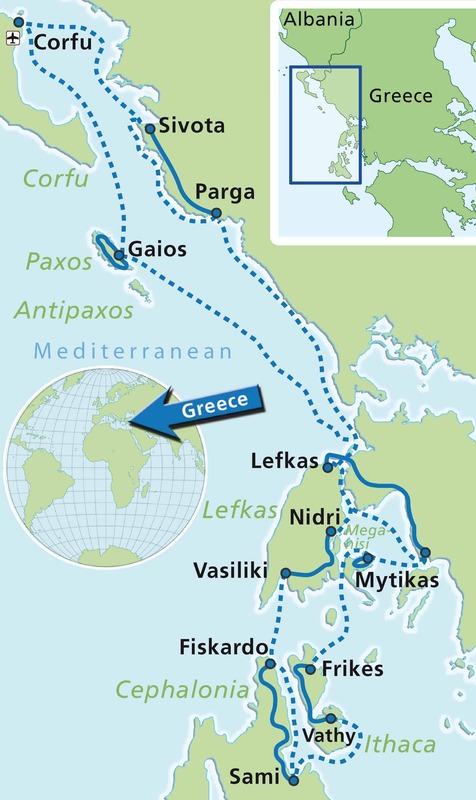 In the afternoon we sail to Paxos Island, whose unique natural harbor in Gaios creates a special island atmosphere. We can spend the evening in one of the cozy taverns of Gaios. Paxos, the smallest of the seven Ionian Islands is a grove of olive trees, which gives the island its wonderful silver green color. On today’s cycle trip we circle the island. We can have our last swim in the Mediterranean on one of the many beaches. After lunch the boat will take us back to Corfu town where we can explore the city once more before enjoying a last evening meal on board together with friends, guides and crew reflecting on the experiences of the week. After breakfast, check-out and individual return home or extended stay in Greece. The cycle routes require an advanced level of fitness from the participants. The daily routes have a length of 12 – 31 mi./20 – 50 km. They lead through hilly or mountainous areas and will be completed without any time-constraints. The cycle tours will take us up to 1,000 – 2,300 ft/300 – 700 m of elevation. There are also some extended climbs where walking your bicycle is of course permitted. Most of the roads are asphalted and rarely frequented. Your tour guide informs you each day about the tour details. Helmet use is mandatory on all cycle tours. You are strongly encouraged to bring your own (well-fitted) helmet. Cycle helmets are available on board in limited number (on request). You are free to set aside a half or full day to swim or spend on board the boat, instead of taking a planned cycle tour. We believe that only children in a good physical condition and with a minimum age of 10 and previous bicycle tour experience are able to master the cycle tours on their own strength. Please note that the minimum height for a rental bike is 1.30 m (4”3’). The on-board chef is a member of the crew and prepares the breakfast and one or two warm meals a day. The catering starts with the dinner on the arrival day and ends with the breakfast on the departure day. The Panagiota does not offer a WiFi connection. If you need to connect to the internet during the tour, we recommend to take your portable electronic device to a cafe or bar somewhere in the harbour. Free WiFi is on offer almost everywhere. If you order something to eat or drink, then you are able to use the WiFi to your hearts content. Please be aware, that we have a weight limit of 22 kg (48.5 lb), if you bring your own bicycle/e-bike on board of one of our boats. This limit is important to protect the health of our guides/crew members, than they have to lift the bikes on board. If we consider it necessary, we will check the weight of the bicycle/e-bike on site. If the weight limit is exceeded, we reserve the right to refuse taking the bike on board. Please bring your personal belongings in foldable travel bags. Please avoid hard protective cases. They will be too heavy to store within your cabin. Our ships Please do not forget that the ship is your hotel as well as a machine, which has to be maintained and operated – day and night. A certain level of noise is therefore inevitable. April 13, 20 and 27; October 5 and 12. With three persons sharing a cabin, we allow a 50 % discount on the basic tour price for the third person, regardless of age, and do neither charge the above-deck surcharge for the third person. Children up to age 16 receive a 25 % discount on the basic tour price (not combinable with the 50 % discount). – Additional nights on Corfu: prices on request. Bike helmets: On all bicycle tours it is mandatory to wear a helmet. In order to guarantee optimum protection we request that you bring your own well fitted helmet and – for your own safety – wear it on all bike tours. Limited amount of helmets are available on board. Legal notice: Boat Bike Tours is not the operator of this tour; this is a so called ‘partner tour’. Tour operator is: Inselhuepfen/Radurlaub Zeitreisen GmbH, Konstanz, Germany. Other conditions may apply to this tour: further details on request. The Panagiota is an affectionately restored two-masted motor yacht. She has 6 cabins below deck and 4 cabins on the main deck, all of which have a small bathroom, air conditioning and are equipped with a French bed. Some have an extra bunk bed, what means a great accommodation for a family vacation. In the spacious and typical Mediterranean styled saloon there are tables and chairs where you can enjoy breakfast and dinner and sit and relax when it’s a little chilly outside. But you will probably spending most of your time – when not cycling – on the rear deck or spacious sun deck.